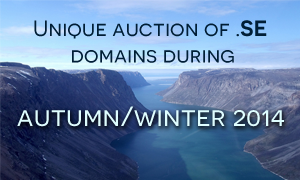 Beginning October 13, a large number of unique .SE domain names that have never before been available for registration will be auctioned during the autumn and winter. The domain names the .SE registry has released refer to country codes, for example cd.se, hr.se and it.se, as well as names of other countries – for example thailand.se and italien.se. This is the first domain auction of this type in Sweden. Overall, there are 349 previously reserved .SE domain names that can now be registered. The domain names have been blocked since 2003 when registration of a .SE domain name became available to the general public. Domain names including country names have been reserved for the particular country in order for it to take advantage of opportunities to gain priority and register valuable domains. However, this has not generated much interest. Since October 13, the domain names have been auctioned off, each batch of domain names running for 10 – 12 days. Both individuals and companies can participate in the auctions. Throughout the recent years, the .SE registry has made several thousand blocked and reserved domain names available for general registration. Those include numerical domains, geographical place names as well as domain names associated with the royal court. If you wish to get a .SE domain name or find out more about the auction, please contact our Support Team at support@web-solutions.eu or via phone on +44 (0) 208 133 3994.